Exciting opportunity for an Orthopedic Registrar to experience the famous New Zealand work life Balance. Whanganui District Health Board is seeking applications from Registrars to join their friendly team in Orthopaedics. This is a full time non-training position with a commencement date of 04 June 2018. Successful applicants will possess a strong interest in orthopaedics and would be keen to become a participating member of the team. The Orthopaedics Department consists of four senior consultants, three registrars and two house officers. As part of this small team, you'll have excellent access to your senior consultants, and unrivalled opportunities to experience any of the varied presentations to the hospital - ensuring an enviable broad skill base that will expand your career opportunities. The role includes an on call component which is shared amongst the General Surgical and Orthopaedic Registrars with a three day weekend on a 1:5 roster covering both General and Orthopaedic Surgery and no night shifts involved. To be eligible to apply for this role, you must possess a keen interest in the area of Orthopaedic Surgery and have a minimum of 2 years post graduate medical experience (preferably including at least 6 months in Orthopaedics). 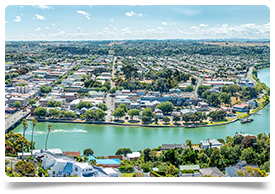 Wanganui (population: urban 42,000, regional 64,000) has a genuine, easygoing vibe. It has all the facilities that you would expect of a small city, yet is still compact and easy to navigate. If you prefer to live a semi-rural relaxed lifestyle, it’s a great place for families with a real sense of community and hospitality with Farmers Markets, little cafes and restaurants, as well as plenty of sporting activities if you want to get involved. You’re also within easy driving distance of premier ski resorts at Turoa and Whakapapa to the north west, the lush Hawke’s Bay wine region to the east, clean and quiet unspoilt beaches (Surf Highway 45, Himatangi, Foxton, Otaki) up and down the West Coast, and of course, to the South is NZ’s capital city of Wellington (2.5 hour drive). Living here is very affordable, with quality housing and a reputation for its excellent primary and secondary education facilities, there is a lot to offer families of all ages. And the commute to work is circa 5-10 minutes from anywhere in the city – it’s a nice way of life if you prefer not to be in a big city. There are daily flights from Wanganui to Auckland, making international flight connections easy.